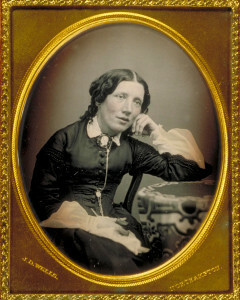 Harriet Beecher Stowe’s (1811-1896) Uncle Tom’s Cabin was already a national best-seller when its author moved to Andover in the summer of 1852. Her husband Calvin Stowe had been appointed Professor of Sacred Literature at Andover Theological Seminary and the couple moved with their six children into a remodeled stone building on campus that had been previously used as a carpentry shop and a gymnasium. During the dozen years Stowe lived in Andover, she was at the peak of her career and international fame. She traveled extensively in support of her books and the abolitionist cause, meeting and socializing with most of the leading figures of the day, including Queen Victoria (who reportedly had wept over her book) and President Lincoln. While most Andover residents were delighted to have a celebrity in their midst, Harriet was viewed with disapproval by many of her husband’s colleagues on Andover Hill. Her home was a lively place much in contrast with her more sober neighbors, chaotic with children and dogs and, in 1854, the town’s first Christmas tree. In the spring of 1861, both Harriet and her husband Calvin threw themselves into support of the town’s war effort. Harriet composed an inspirational “Banner Song,” which was sung to the tune of “America,” and continued to write stories and articles on patriotic themes.